Symphony™ II power management system allows homeowners to keep more of their comforts without needing a larger generator. At this year’s 2011 IBS generators were a major focus and the folks at GE gave us a really cool tour of their new vertical whole house generators along with the Symphony™ II Power Management System. The new vertical shaft design on these generators reduces the footprint and makes them look more like an A/C unit. The Symphony™ II Power Management System was very interesting as well. If you’d like to learn more about this great new offering from GE check out the official press release below. MILWAUKEE (January 4, 2011) — Committed to helping families power more for less, today GE unveiled a more powerful vertical automatic standby generator system, powered by Briggs & Stratton®, at the International Builders’ Show. “Through our continuing dialogue with homeowners we found that they want more powerful, smaller standby generator units that they can place closer to the house,” said William Reitman, Senior Vice President, Business Development and Customer Support of Briggs & Stratton, exclusive licensee of Standby Generator Systems by GE. “We have delivered that with our new 13kw* vertical generator and the Symphony II power management system.“ GE generators are now available in a more powerful 13-kilowatt output. This advanced generator gives homeowners peace of mind by providing access to their home’s key appliances and electricity-dependant systems during a power outage. Families can power more of the devices they need to live comfortably, while still keeping the important systems up and running. Featuring the legendary design of a GE home appliance, the 13kw unit is 15 percent smaller than other whole house standby generators so it blends in to the yard. Powered by a durable Briggs and Stratton Professional Series engine designed specifically for generators, these generators can run on either LP or natural gas. Removable cabinet panels give technicians easy access for fast and affordable service calls and routine maintenance. The new 13kw GE generator comes with the Symphony II power management system. The Symphony II system manages a home’s power needs during a power outage by electronically controlling electrical loads, which allows homeowners to power more with a smaller generator. Because this is done automatically, families can continue living with little disruption. Upon installation, the appliances in the home are prioritized. When a power outage occurs, the Symphony II system goes to work and automatically powers the highest priority appliances until the generator reaches its maximum capacity. If a higher priority appliance should need more power, Symphony II will electronically control the lowest priority appliances until enough power is available to restore the higher priority appliance. For example, a homeowner could set the air conditioner as priority one, and the dryer as priority eight. Priorities two through eight are running and the generator is at maximum capacity. As the house warms up, the air conditioner may be called to start, in which case the Symphony II system will turn off the dryer (priority eight), which will allow the air conditioner (priority one) to turn on. Installation of the Symphony II system is easy. The Symphony II communicates over the existing power lines in the home, which means little wiring is required at installation. Additionally, Symphony II control modules can be installed at any point between the appliance and the electrical panel. This provides flexibility for the installation location. Symphony II is also available separately and can be used with any GE automatic home standby generator. 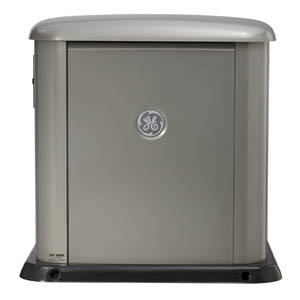 GE generators are available at homedepot.com and at Certified GE Generator Systems Dealers nationwide. For more information on GE generators and the power management system visit www.powermoreforless.com.